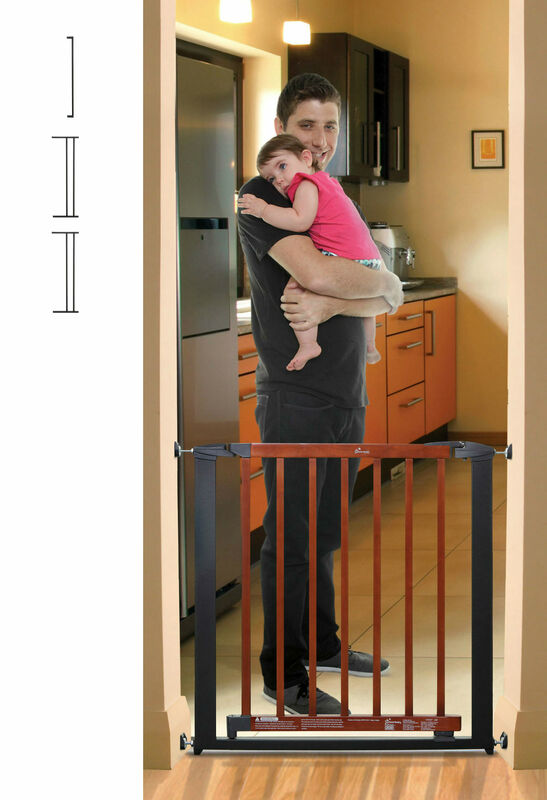 Hallway Security Baby Gate Plus Two 3.5″” Extensions – Black (45.5″” to 49″”W) is a standard height gate of 29.5″”, pressure mounted and steel with 2 1/4″” bar spacing and a 20″” door opening with easy one-hand operation for adults. Liberty Xtra Hallway Security Baby Gate Plus 7 inch extension in White – Suitable for doorways and hallways. Gate stays open in both directions. Simple one-handed operation. Pressure Mounted and easy to install. 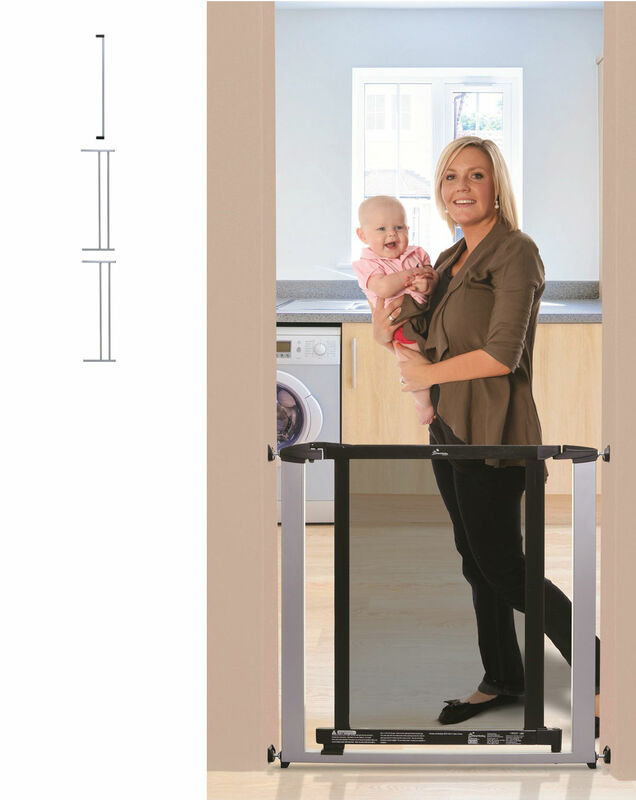 This package of the white Liberty Security Baby Gate includes one 3.5 inch and one 10.5 inch extensions. Gate stays open in both directions. Simple one-handed operation. Pressure Mounted and easy to install. 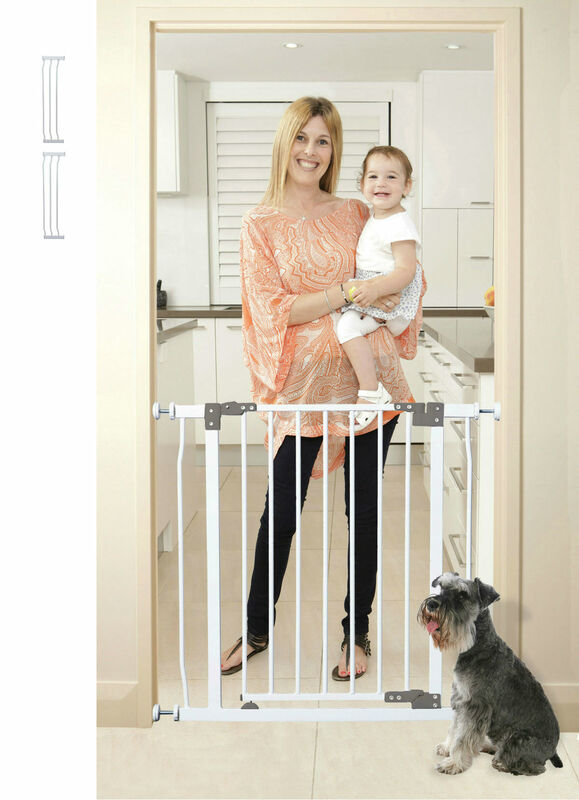 Liberty Security Baby Gate Plus Two 7 inch extensions in White – Suitable for doorways and hallways. Gate stays open in both directions. Simple one-handed operation. Sturdy, Pressure Mounted and easy to install. 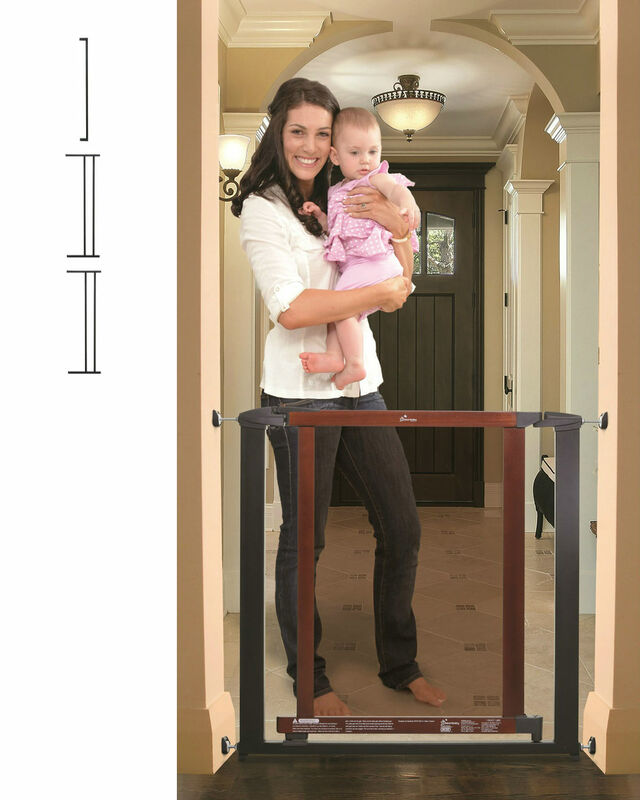 Metropolitan Pressure Mounted Baby Gate Plus Two 7″ Extensions-Charcoal w/Cherry Color Wood has a charcoal colored, steel frame with a cherry color wooden door frame and strong, tinted, polycarbonate panel. Door swings open in both directions. 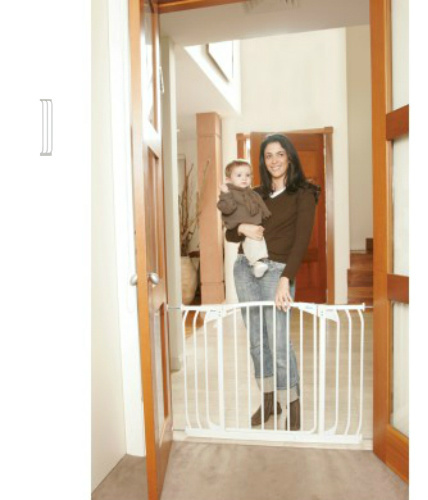 Metropolitan Pressure Mounted Baby Gate Plus Two 7 Extensions-Silver with Dark Wood has a silver colored, steel frame with a wooden door frame and strong, tinted, polycarbonate panel that swings open in both directions and swings closed automatically. Hallway Security Baby Gate Plus 7″ Extension – White (45.5″ to 49″W) is a steel gate with a door opening 20 inches in width. The gate is pressure mounted which makes it easy to set up and take down. 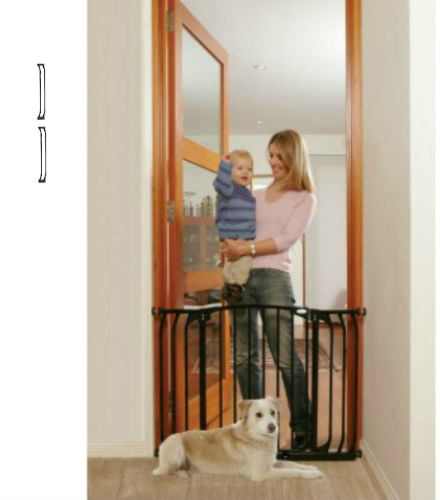 Mounting cups are included which are optional but recommended if gate is to be used at top of stairs. Hallway Security Baby Gate Plus One 7″ Extension – Black (45.5″ to 49″W) features a 20 inch door opening. The door opens in both directions and swings closed automatically. The gate is steel and pressure mounted which makes it easy to set up and take down. 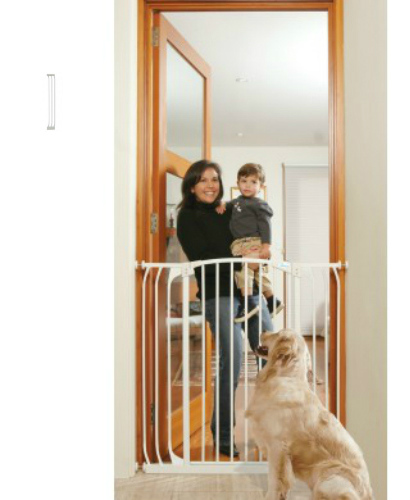 The Hallway Security Baby Gate Plus Two 3.5″” Extensions – White (45.5″” to 49″”W) is a steel, pressure mounted gate with a convenient 20 inch door opening which opens in both directions and swings closed automatically. Standard height of 29.5″”. Tall Hallway Baby Gate Plus Two 3.5 Ext. 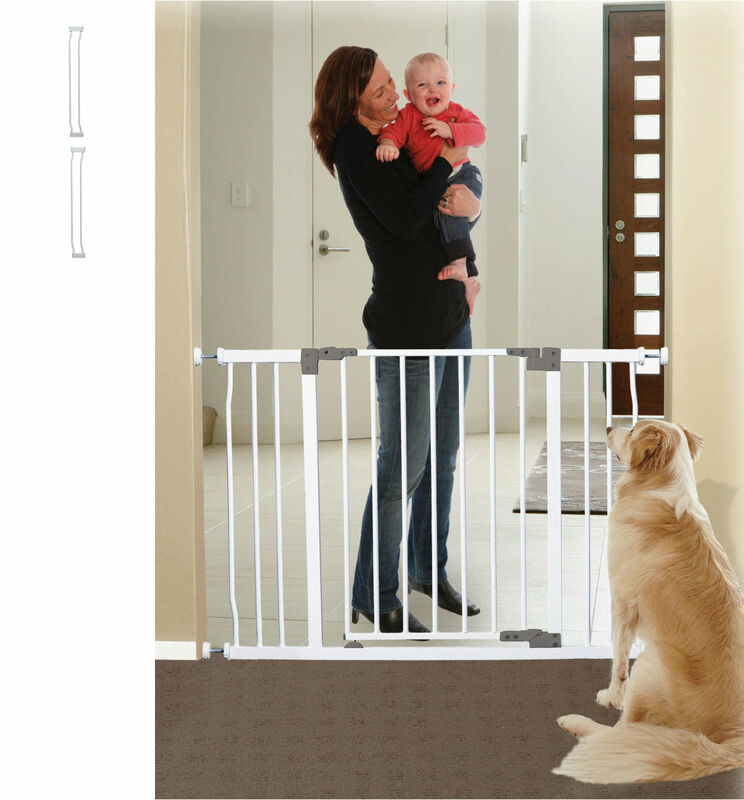 (45.5 to 49W) – White package is a pressure mounted baby gate plus two 3.5 inch extensions which allows the door opening to be centered with one extension on each side of the gate. Tall Hallway Baby Gate Plus Two 3.5 Ext. (45.5 to 49W) – Black with a 20 inch door opening and a height of 39.4 inches. Pressure mounted gate with easy one-hand operation for adults. Extra Tall SC Hallway Baby Gate Plus 7 Ext. (45.5 to 49W) – White package includes gate plus one 7 inch extension in an extra tall height of 39.4 inches. Door (20 inches) opens in both directions and swings closed automatically. 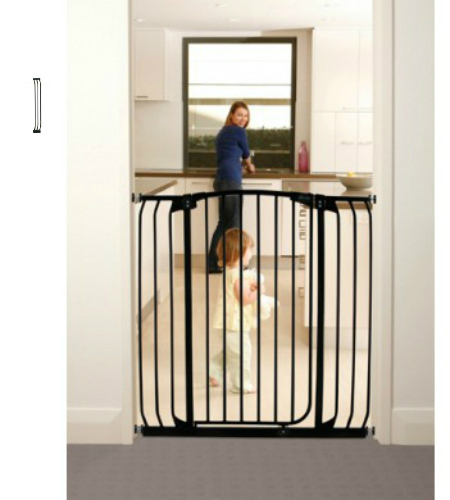 Extra Tall SC Hallway Baby Gate Plus 7 Ext. (45.5 to 49W) – Black – Pressure Mounted – Easy to set up! – Package includes one 7 inch extension. Door opening 20 inches wide.